Serving Maple Ridge and Pitt Meadows for more than 25 years! The Canadian Dental Association recommends sports guards as an effective way to prevent injuries to the lips, tongue, face, teeth or jaw for everyone who takes part in a sports program. Athletes of all ages should wear custom sports guards for sports such as ice hockey, soccer, boxing, basketball, martial arts, field hockey, football, lacrosse, roller hockey, rugby, skiing, squash, volleyball, and wrestling. Sports guards give a protective, resilient barrier over the teeth that distributes force more evenly. 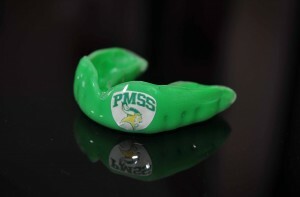 Studies show that sports guards can help prevent teeth from being shifted, chipped or knocked out. They also minimize other oral injuries to areas such as the lips and tongue. Superior protection with adequate thickness in critical areas. Strong and comfortable, without feeling bulky. Perfect fit so it will never fall out. Allows you to talk normally and does not interfere with breathing. We at the Pitt Meadows Dental Centre want to help provide every athlete with adequate protection against oral/facial injuries while participating in sports and activities they enjoy. That’s why we’re offering customized sports guards to our community for only $35. The sports guards we create for you are considered equal to those worn by professional athletes. Set an appointment to get your custom fit sports guard today by calling us at 604-465-7733. © 2013 Pitt Meadows Dental Centre. All Rights Reserved.